Michelin stealth wiper blades come in a wide variety. You can choose from the various models depending on whether they are compatible with your vehicle. Some are all-weather blades which work well in stormy weather and winter conditions. The designs in some of them allow them to adapt to your windshield, providing better performance and a very clean wipe. Other features that they offer include durability and keeping off dirt, ice and snow. Consider the models explained below. These are some of the best performing blades in the industry. They have been tested and found to exceed the performance of all their competitors even after 300,000 wipe cycles. These wipers are designed with smart flex technology which makes it possible for them to adapt to the curve of the windshield. The independent suspension allows for strong contact with the windshield from one end to the other. They can thus perform well in all harsh weather conditions. They also come with a smooth aerodynamic cover that protects them in all conditions. In this way there is no accumulation of snow, ice or debris. They weigh only 7.4 oz and have product dimensions of 28.6 x 1 x 3.1 inches. They do not fold. They adapt to the shape of your windshield and hold down from end to end. They will thus provide excellent performance in harsh weather conditions. They also will not leave streaks and smearing and will definitely not have a squeaking sound when doing their job. They are easy to install and to take off. They may not fit on all vehicles and sometimes may wobble. 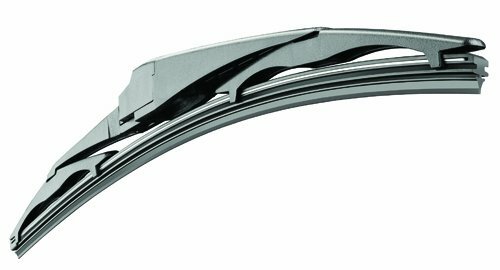 This Michelin stealth wiper has been tested and found to outperform all blades in the market. It has excellent features including the smart hinge which causes the wiper to grip the windshield securely. The independent suspension at the end of the blade enables it to conform to the shape of the windshield so that the entire wiper grips the surface. There is a smart hinge cover that keeps the wiper from accumulating dirt, ice and snow. The blades are easy to install and also to replace with the EZ-Lok connector that they come with. Their dimensions are 30.8 x 3 x 1 inches and they weigh 10.4 oz. The wipers are protected from dirt, ice and snow. This enables you to drive more safely in harsh conditions. They may not hold up well in winter climates especially when they are not new. However they work well for heavy rain conditions. They may not be compatible with all vehicles. It is good to inquire about this before making the purchase. This is a strong product that is built to last for a long time. It is easy to install and it comes with easy fit connectors. It is a rear wiper that fits specific vehicles and so you will need to confirm that it fits your before purchase. The design allows for even and quiet performance of the wipers as they are made of compression-moulded rubber. They also have an aerodynamic design. They are built to last long as they have a durable powder coat finish. They also have a tough hard-moulded frame with a steel insert which works to increase their strength. These blades weigh 4.8 oz and have dimensions of 22.5 x 2.6 x 1.1 inches. They operate quietly and smoothly. They do not leave streaks and will provide you with a clear view through your rear mirror whatever the weather may be. They are strongly built to ensure that they last long. It does not fit all makes of vehicles and even some of the ones specified by the manufacturer. This is a blade designed to provide quality performance in all weather conditions. This 22 inch blade is built with stealth technology to adjust to windshield contours and arm pressure. This allows it to give a clean wipe in any weather conditions. This blade does not clog with ice or snow and it works without chattering. It has a pre-installed connector to enable you to install it easily and it. They work quite well in harsh winter conditions. they are pretty strong and can endure these conditions. They apply pressure uniformly across windshield so that you get a clean wipe. They also do not leave streaks and smears. They have been reported by a few drives to have scratched their windshields especially during the first try. They may not fit some vehicles including some that have been listed as compatible with these. The hard plastic cover may break during cold and icy conditions. They may streak during light rain and when it is misty. These 15 inch blades are made of compression-moulded natural rubber. They come coated with a special formula called M-Guard. The frame which is of an Aero Vented design is all metal and made of heavy duty steel. The performance of the wiper is greatly enhanced by the powder coat finish. It also ensures that it lasts for a long time. Installation is fast and easy as the wipers come with an Ez-Lok connector system. They provide a very clean wipe which is streak-free. They are built to endure through rough weather and last a long time. It may not fit all vehicle types and you will need to confirm with the seller before making a purchase. 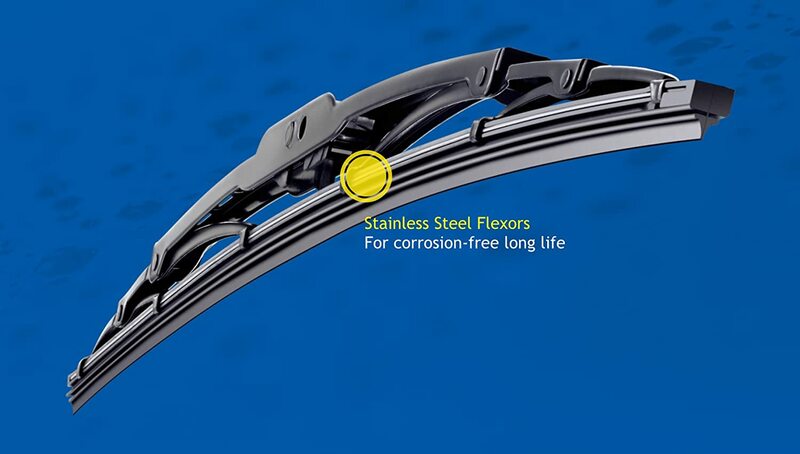 Michelin stealth wiper blades thus come in a wide variety. They all come in a pack of one and thus you will need to buy two if replacing both wipers. Take your time when going through the reviews and checking out whether the particular brand is compatible with your vehicle. Michelin has some of the best wipers and you will not go wrong with them. I just replaced Anco wipers to 22″ Michelin Stealth blades. they both attach in the same way. very simple, only they will fall off apparently the plastic lock tab is not holding it on , I use the side pin type of metal arm . I’m sure one of the locks is broken and the other blade can be taken off without lifting the lock. This is for a 94 Buick Roadmaster, which I take meticulous care of, and I am very handy. If I had a phone # I would be glad for someone at Michelin to contact me. As it is I can’t drive in the rain !